I never cease to be amazed at the pervasive contempt in which professional homebirth advocates hold their own followers. Contempt for the obligations they owe their followers: they have no compunction about tricking them into risking the lives of their babies by using mendacious means to convince them of homebirth safety. Saraswathi Vedam’s Homebirth: An Annotated Guide to the Literature © is a case in point. Vedam has helpfully provided a list of 66 separate citations. 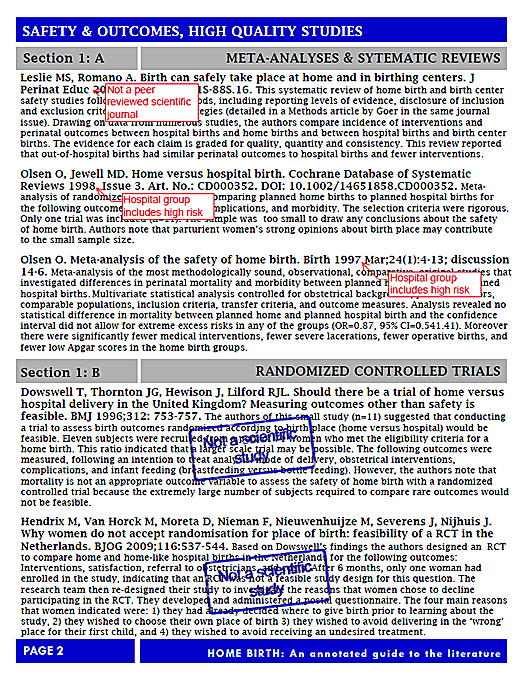 But if you read each and every citation, as I have done, you will find that only 3 of the 66 “citations” support the claim that homebirth is as safe as hospital birth. Vedam was one of the organizers of the recent Homebirth Consensus Summit, a public relations ploy to elevate the status of homebirth midwives, giving the impression that they were “invited to the table” by the expedient of creating the table and issuing all the invitations. This annotated bibliography provides citations and critical appraisal of original studies on home birth. In other words, it’s a document designed for advocacy of homebirth, not truth about homebirth safety. And homebirth advocacy organizations, including Citizens for Midwifery (CfM), the Center for the Childbearing Year, and the Coalition for Improving Maternity Services (CIMS) are duly offering copies of the Guide on their websites. Let’s start with the title. Reading it, you might think that the guide provides an overview of scientific citations and original scientific research on home birth. You’d be wrong. Sure, there are some scientific studies in there, but out of 66 total “citations,” fully 25, more than 1/3, are not scientific studies at all, 1 was never published and 1 was published in a non-peer reviewed publication. Well, that’s not too bad, is it? 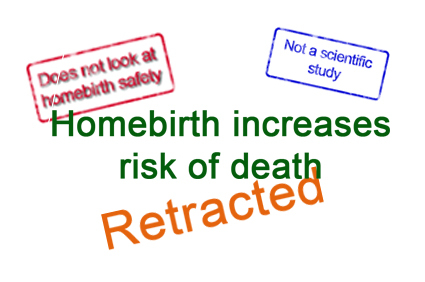 Vedam has compiled and annotated a list of 39 studies that “support” homebirth and its safety. 17 do not address the issue of homebirth safety. Okay, so in an effort to support homebirth, Vedam has compiled and annotated 21 contemporary scientific studies that address the issue of homebirth safety. And they show that homebirth is safe, right? That’s right. Out of 66 separate citations in Vedam’s Guide, only 3 show that homebirth is as safe as hospital birth, 2 from Canada and 1 from the Netherlands. The results from the Dutch study are called into question by the fact that it compared homebirth with a midwife to hospital birth with a midwife. A more recent study showed that low risk birth (home or hospital) with a Dutch midwife has a HIGHER perinatal mortality rate than high risk delivery with a Dutch obstetrician. Of course, nothing brings the point home like an illustration, such as the view of a typical page of the Guide posted below. Vedam’s deeply disingenous Guide shows how professional homebirth advocates use the forms and language of science to mislead their readers and the contempt that they have both for their readers and for the truth. ← Is homebirth like amniocentesis? A quick search on our Dr Amy yields some interesting results, including references to her defamatory remarks about researchers referred to in this blog. You all seem quite angry. This is always unproductive. I would suggest to relax and accept that people have the right to decide how to approach their child’s entrance into the world. Stop being so dualistic! Right, because “tone trolling” is way easier than confronting facts.